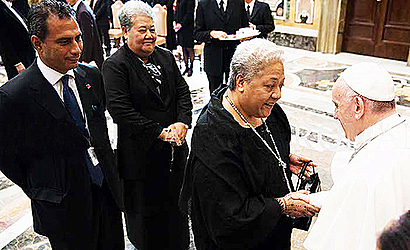 Deputy Prime Minister, Fiame Naomi Mata’afa, has met with Pope Francis in Rome as part of a united bid by the Pacific to strengthen their voice on climate change. 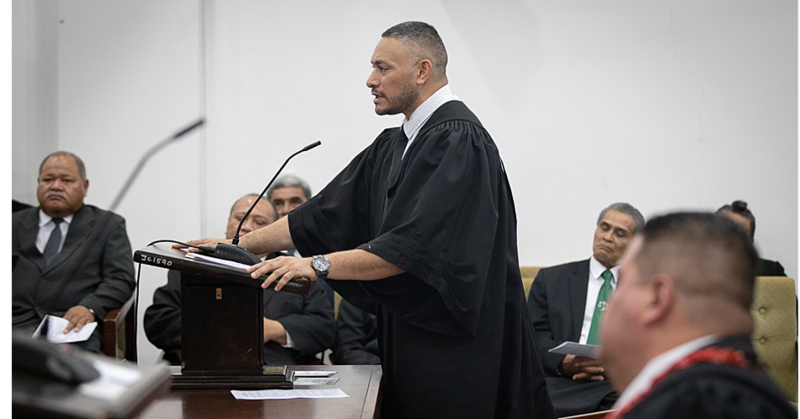 Fiame, who is also the Minister of Natural Resources and Environment, was among a group of leaders from the Pacific who had an audience with the Pope during the weekend at the Vatican. She was accompanied by the Chief Executive Officer of the Ministry of Foreign Affairs and Trade, Peseta Noumea Simi and Samoa’s Honorary Consul in Italy, Papali’i Giovanni Cafferelli. They met with the Pope on their way to the 23rd Conference of the Parties to the United Nations Framework Convention on Climate Change (U.N.F.C.C.C. C.O.P.23) being held in Bonn, Germany this week. During the meeting, Pope Francis shared his concerns about the impact of rising sea levels on vulnerable island, coastal and fishing communities. The Pope called for global cooperation, for solidarity and strategies to address the deterioration of the environment and the health of the oceans. He blamed many of the causes of this “environmental decay” on short-sighted human activity, provoked by the exploitation of natural and human resources. During an interview with the Vatican Radio, Deputy Prime Minister Fiame stressed that the Pacific nations have been advocating strongly to further limit the raising of the global temperature to 1.5 degrees, rather than 2 degrees. With scientific evidence pointing to an acceleration of climate change, she said, the Pacific Island nations are hoping to show how urgent the issue is, as well as proposing realistic ideas on how to achieve the 1.5 limit. “We will also have to look at whether we can strategize and organise as a community of parties to respond to the U.S. decision to withdraw from the Paris agreement,” Fiame is quoted as saying. 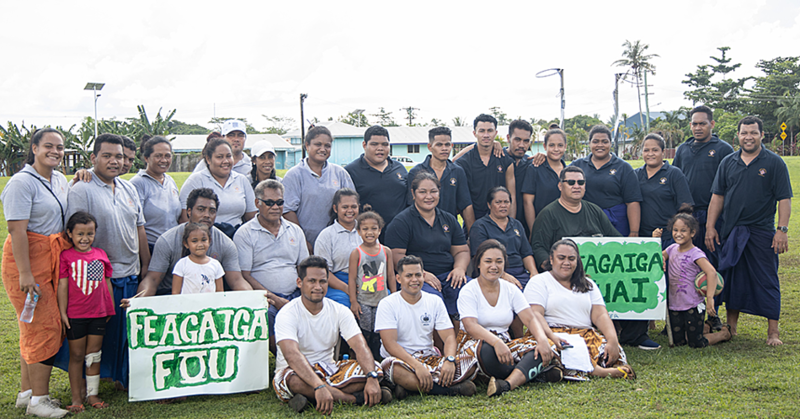 The Deputy Prime Minister pointed that while Samoa is predominantly volcanic, other low lying countries like Tuvalu, Tokelau or Kiribati are experiencing serious impact, both in terms of encroachment of land and water tables. Several countries have already purchased land in Fiji in response to the risks, but she notes the question of sovereignty is a pressing one. “What happens to a country when they lose their land, how do you re-determine your sovereignty, maintain your cultural identities and so forth?” Fiame asked. She noted that these are global problems “but the immediacy of the issue is there for us. “We’re seeing natural disasters increase all around the world and no country can claim to be free from the effects of climate change,” she said. 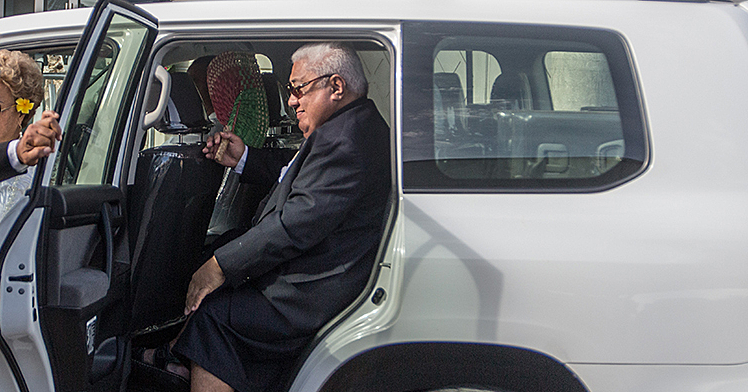 In the absence of the Chairman of the Pacific Islands Forum Meeting, Tuilaepa Sailele Malielegaoi, Incoming Chairman and President of Nauru, Baron Waqa, spoke on behalf of the Pacific. “We have travelled great distances from our island homes in the Pacific Ocean. We, the people of Micronesia (where I am from), Polynesia and Melanesia, are stewards of this vast ocean continent. We are mindful of our responsibilities to take care of this global asset and the natural resources bestowed upon us, now and for our future generations,” he said. “As one Blue Pacific region, we have built solidarity through collective action and one voice in the global arena. Collective action that is reflective of age-old traditional values that are very dear to us – values of communal ownership and collective delivery for the benefit of all our peoples. “So has been our strong advocacy on climate change and its impacts on our island homes, our people, our environment and indeed our future generations. We are at the forefront of the impacts of climate change. The devastating impacts of cyclones, earthquakes and tsunamis in recent years, have resulted in enormous losses for our smaller island economies which have taken decades to build. However, it does not stop there. President Waqa praised Pope Francis for re-invigorating the discussion on recognising, first and foremost, the most vulnerable to climate change. “The Pacific has borne the brunt of this existential threat at no direct fault of ours. We need to ensure that the world takes some responsibility and commit to a loss and damage clause in Bonn. “We recognise the moral authority that you carry and commend the strong voice that you have added to the discourse on climate change. We are here to seek your support to strengthen our message to the world. At COP 23 we will stress the need to uphold the spirit of the 2015 Paris Agreement and urge all Parties to reinvigorate their commitments to limit the temperature increase to 1.5°C above pre-industrial levels. “The 1.5°C threshold for us, is a matter of survival. There is no other choice for us. There only remains a few years before we exceed CO2 levels that will make temperature rise to levels that will see many parts of the Pacific disappear. “Laudato Si emphasises the need for a conversation that includes everyone, recognising that the impacts of climate change is not discriminatory and affects society as a whole. A key outcome for the Pacific would be a well-defined Talanoa Facilitative Dialogue to generate political momentum for all Parties to the COP to meet commitments in the Paris Agreement. “I have often wondered of the influence that we as Small Island States can command on the global stage. I am assured now that as a collective, as one Blue Pacific region, we can go the distance. It wasn’t just climate change that was on the agenda. Oceans was also highlighted by the Pacific delegation. Prime Minister of Cook Islands, Henry Puna, spoke on behalf of the Pacific leaders. “Our ocean and its resources are fundamental to and inter-twined in the lives of we - the Pacific peoples. Our ancestors have a magnificent history of voyaging through knowledge of the stars and the currents of our vast Ocean,” said Mr. Puna. “We are now reviving these skills and our island peoples are making similar journeys across the pacific and around the world - creating awareness of the responsible stewardship required of this important natural asset - for our peoples, our place and our planet. “Our ocean is our livelihood. That demands great responsibility by our governments and by us as elected Pacific leaders - to ensure that we are both prudent and accountable in our management and stewardship of the ocean. However, we share our ocean with many others who are not as reliant on the ocean and its resources. Consequently, they pollute it, they use it as a dumping zone, they have tested nuclear weapons above it and store nuclear waste in it (with devastating effects on some of our nations and on the ocean itself), and they either fish illegally or overfish our fish stocks. “In recognising the centrality of the Ocean to our lives and the sustainability of our communities, Pacific Leaders endorsed the Blue Pacific as the narrative of our identity, our collective stewardship of the ocean, and the sustainable development, management and conservation of it and its resources. “We are very aware of the vital role played by the world’s oceans in driving the global climate system and in particular in regulating temperature and that it serves as the largest carbon sink. We are also alarmed that due to unsustainable carbon emissions the ocean and its delicate ecosystems are being placed under considerable stress. “Today, the challenges that we and our Ocean face are severe; climate change has raised sea surface temperatures, underwater currents and ocean acidification. It has generated the redistribution of fisheries, both oceanic and coastal, which impacts on the livelihoods and food security of our people. “We know that the Pacific Ocean is rich in resources because we provide 56% of global production of tuna; this represents 2.7 million tons each year. But while we place food protein on the table of many Europeans, we have to contend with illegal, unregulated and unreported fishing by distant water fishing nations exploiting our fisheries resources. We also know that we have rich deep sea mineral resources and marine genetic resources that are important for us to meet our sustainable development aspirations. “We have to make tough decisions and make tough choices in exploring opportunities for our own economies and sustainable growth – while always being mindful of and recognising the impact and consequences on the ocean and the bounty that it provides. Our region needs to capitalise on the vast marine protected areas that we have established, for example Marae Moana Ocean Sanctuary of the Cook Islands which is over 1,976 thousand square kilometres; this is over 6 times the land area of Italy. “Laudato Si advocates, and quite rightly so, the importance of sound and robust ocean governance to address these contemporary challenges. Recognising international and regional conventions that exist, the pressing issue is promoting integrated governance of our ocean and marine resources, to serve not only the Pacific but the Planet at large. Lastly, equality and human rights was also highlighted during the gathering, the Prime Minister of Vanuatu, Charlot Salwai Tabimasmas, spoke about. “One in four people live below their national basic-needs poverty line; and have limited access to essential services such as education and health services,” he said. “These issues become more prominent with the rapidly shifting social and economic landscape from traditional systems in all sectors of the economy to market-led cash-based systems. “The volatility in economic growth trends across the region have been further exacerbated in recent years by the unprecedented frequency of strengthening natural disasters which have crippled island economies – an example being my island home Vanuatu which was hit by a Category 4 Tropical Cyclone in 2015. “Relatedly, Laudato Si firmly and unequivocally characterises climate change as a human rights issue calling for radical and urgent transformation of global politics and individual lifestyles to combat it. “Globally, the rise in the number of migrants seeking to escape increasing inequality and poverty brought on by environmental degradation is indeed tragic. In the Pacific region in particular, the issue of climate migration is now a reality. “Island States have begun discussions on the options for re-location and re-settlement. We remain cognisant of the fact that re-location and re-settlement will introduce multi-dimensional issues that will need to be addressed. We echo the call of Laudato Si for the acceleration of international conventions that recognise climate refugees so as to ensure basic elements such as legal protection in new states. “Stronger and more decisive global and international politics is essential to tackle the increasingly diverse issues relating to human rights. On a related matter, may I take this opportunity to reflect on an issue close to my heart – that of the alleged violations of human rights in West Papua. “We cannot continue to turn a deaf ear to the long-standing allegations of human rights abuses in West Papua. In 2016, Pacific Islands Forum Leaders, in recognition of the importance of this issue, agreed that this issue remain on their agenda. “Holy Father, at its core, Laudato Si urges the recognition of the vulnerable at all levels of society. The issue of West Papua continues to elude a formal international review mechanism because of the political sensitivities surrounding this issue and I must reaffirm the need for stronger and more decisive global politics to address the most critical issues that impact our societies and our people. “As we have seen, the politics surrounding climate change has not been sufficient, this we are sure of. However, we remain hopeful that COP 23 will set the tone for a more ambitious and decisive C.O.P. 24 in Poland. The leaders have moved on to Germany for C.O.P.23.